By default, when you reply to an email in Mail, the content of the email is included in your reply. If you only want to quote a part of the email, you can just select what you want to include and when you hit Reply, it will only include the selected part. 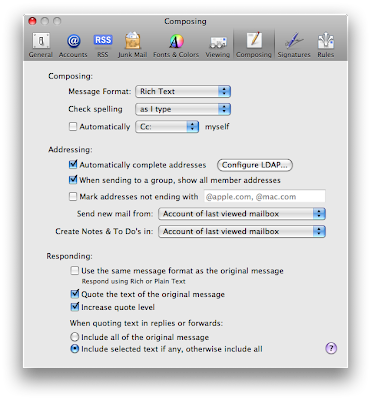 You can change that behavior in Mail Preferences, under Composing. 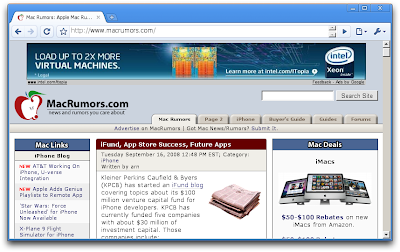 Ctrl-Tab is a Firefox add-on to visually switch between tabs. The Ctrl-Tab shortcut already works in Firefox, but once the add-on is installed, you get a preview of all tabs in the currently active window. You can also get a grid with a preview of all tabs open in Firefox with "Command - Shift - A". You can get more info or download the add-on here from Mozilla's website. 1. Download the modem scripts for your Blackberry phone and drop the scripts in this folder: Macintosh HD:Library:Modem Scripts. 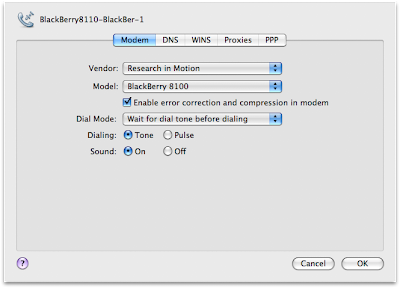 You can find the modem scripts for the Blackberry 8100, 8700 and 8800 and where to drop the script here. 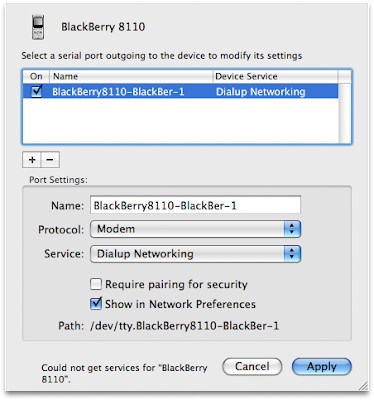 If you have links to modem scripts for other Blackberries, please post about it in the comments. 2. Pair your phone with your Mac through Bluetooth. 3. 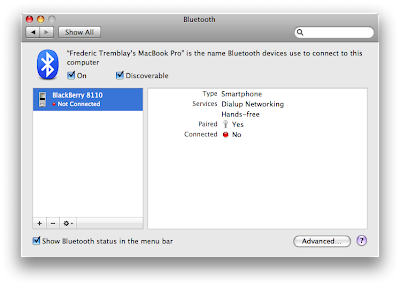 Select your phone and click on the gear in the Bluetooth Preferences. Choose "Edit Serial Ports". 4. Add a serial port. Change the Protocol to "Modem" and the Service to "Dialup Networking". 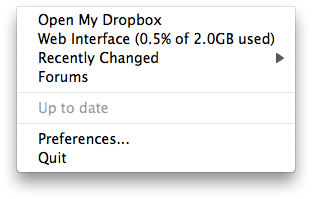 Check the box next to "Show in Network Preferences". 5. Go to "Network Preferences" and select the serial port that you just created. It is called "BlackBerry8110-BlackBer-1" for me. 6. In "Telephone Number", enter the APN of your service provider (internet.com for Rogers Wireless), the User Name in the Account Name field (wapuser1 for Rogers) and the password (wap for Rogers). You can Google that information for your service provider. 7. In Advanced, select the Vendor "Research in Motion" and the Model that matches your phone. 8. That's it! Click Connect and it should log on. You really should get additional info from service provider. Not all wireless service provider included tethering and you don't want to end up with a huge bill. There are many features in OS X that are just not included with Windows, like PDF. Another one is zip. You can right-click on any file to compress it and it will create a zip of that file. If you are going to transfer a Pages document to a Windows or Linux computer, it is really better to zip it first, because Pages documents are actually folders. I often store documents on my Linux server and when the files come from iWork, I always use the "Compress" feature. 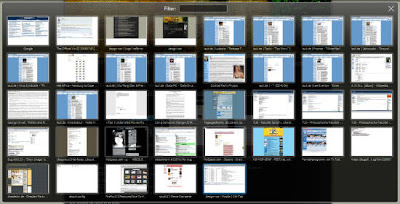 The way it works is actually very useful as you can access all the media that is stored in the folder. 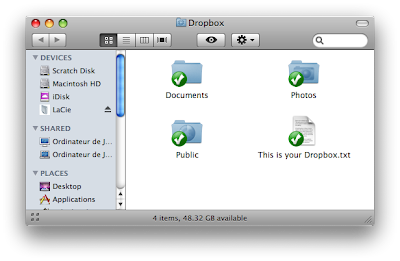 You can look through the folder on a Mac as well using the "Show Package Contents". There are some useful preferences that are not in System Preferences but in Finder Preferences. 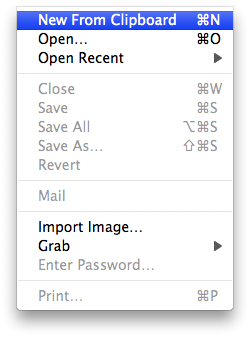 You can get it in the Finder menu, under Preferences. 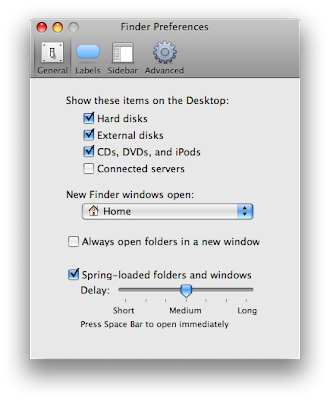 The one I want to talk about today is "New Finder windows open". This applies to when you open a new Finder window using "Command - N". You can change it to any folder on the hard drive. I received many emails about the fact that the widget started linking to the comments feed instead of the content this week. Nothing changed with the widget so I think something changed with Blogger. I have updated the widget and it seems to be working now. You can download the new version here from MacUpdate. I talked about using the Facebook chat in a chat application like Adium and I thought it was really cool. I have figured out that it is not the best thing. It seems that the Facebook chat is not designed to be used to replace iChat, MSN, Yahoo Messenger, etc. The problem is if you leave Adium Facebook chat open and browse Facebook in the web browser at the same time. I couldn't figure out why I was always getting logged out of Facebook and I really thought it was bugs in the new interface. I finally figured out that the best thing to do is to log out of Adium Facebook chat before browsing Facebook in the web browser. The problem seems to be that Facebook doesn't accept two sessions open at the same time. If you are in Canada and using Videotron as your ISP, you can download a widget that fits into your dashboard from the apple site. Just plug in your account info and it should work perfect! I did it with an external hard drive hooked up to my time capsule, so it's wireless. Under the "Advanced" tab, there should be a check box that says, "make a copy of the file when added to iTunes" or something like that. The point is to uncheck it. If you FIRST put all of your music files onto your external drive, THEN delete all of the song listings in iTunes itself so it shows no duplicates, and in the actual "iTunes music" folder to delete the actual files off of your hard drive.When iTunes is clear, connect to your external drive, and drag the music files from your external drive, to the iTunes library, it will "reference" the songs, without adding or copying the actual files to itunes. Basically, iTunes will read off of your external drive, it's really great if you need to save space, and if you have a time capsule, it makes it really nice. Thanks for the tip Christian! That is one thing that is not a good idea: moving a downloading file! I did it accidentally today with a file downloading in Firefox. While the file is downloading, all the data is stored into a second file ".part". To my surprise, the download continued after moving the file and the data continued to be saved in the ".part". Once the download was done though, Firefox couldn't save the ".part" data. Since all the data was downloaded, the whole file was in the ".part". I just renamed the ".part" file to the extension the file was supposed to have and it worked great. All of this was tested with Firefox. ISPs around the world are more and more implementing bandwidth caps. We've had these caps in Canada for years, but bandwidth monitoring is even more important now that most ISPs are going in that direction (Comcast with the 250 GB limit). I still haven't found anything that really works well for monitoring usage directly on the router, but there are quick and easy options for monitoring it on your Mac. Of course, there are numerous disadvantages: all bandwidth going through Airport is counted, including file transfers between Macs and you have to monitor it on each computer separately. 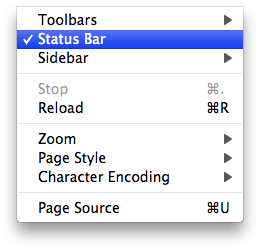 The one that I use is not ideal because it resets every time you restart your Mac. There are probably better applications that don't do this, but this one just appeals to me because I use it anyway for many other things. It is iStatMenu. 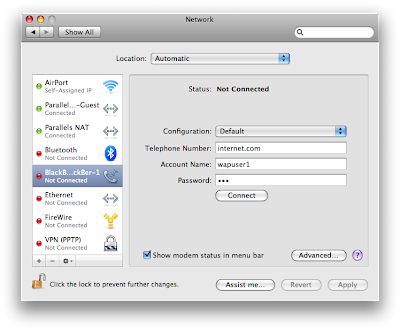 If you add the Network menu to your menu bar, iStatMenu will keep track of bandwidth used and you can access it at anytime in the menu. It works pretty well for me because I don't use Airport for file transfers (Ethernet is fast for that!) and I nearly never restart. The same application also provides Uptime in the CPU menu so you can get an idea of the period of time that bandwidth was used. More info and download link here on MacUpdate. 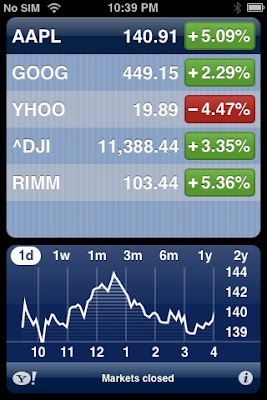 There is a setting at the back of the Stocks widget included with OS X to change from the change value to the change percentage. There is another way to switch. You just have to click on the red or green rectangle. 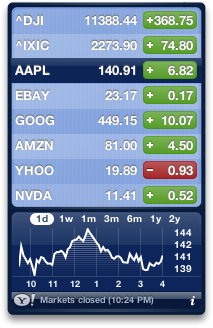 The iPhone stocks widget also works in the exact same way. Skype with a USB headset! There are many ways to use Skype: headset, headphones and internal mic, bluetooth headset and Skype phone. The headphones and internal mic is great because it makes Skype available to everyone. It is not the best configuration however. The problem is that even though Skype has separate settings for Ringing and Audio Output, there is no way to set headphones and internal speakers as separate audio outputs. Using any of the other options solves this problem because it is recognized as a separate audio input/output. The USB headset is what works best for me. I don't why, but the sound quality of bluetooth is terrible compared to how bluetooth works with my iPhone. Preview has a great feature, "New From Clipboard". It works great for just copying and pasting into a new picture. I wish that feature was also in Photoshop, but there is a quick way of doing the same thing. Once the picture is copied, you just have to create a new picture. 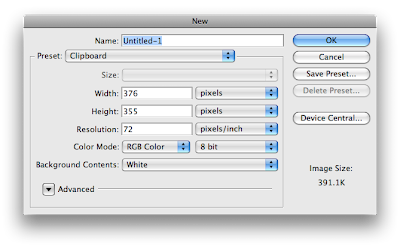 Photoshop will automatically choose the preset "Clipboard" that contains all the right settings for the picture in the clipboard. One thing that I hate about OS X is when I try to rename a file in list view and it won't even let me write the name of the file. It just doesn't stay in rename mode. That happens often in a folder that contains many videos. What happens is that the icon preview is being generated. You can see it as the icon on the left of the name of the file is blank. Each time an icon appears, it switches back out of renaming mode. The only way I have found to rename a file when that happens is to wait for all icons to appear. I really hope Apple will fix this, but in the meantime, it is the only way I have found to rename the files. This iDisk replacement is so good, that I use it instead of dotMac even though I pay for dotMac. The free account includes 2 GB of storage. The way it works is it creates a folder on your Mac that is synched back to the cloud and to every other Mac, Windows and Linux computers that it is installed on. You really have to give it a try to understand how great it is. You can even restore deleted files through the web interface. You just have to download the software and you can create your account through the app. 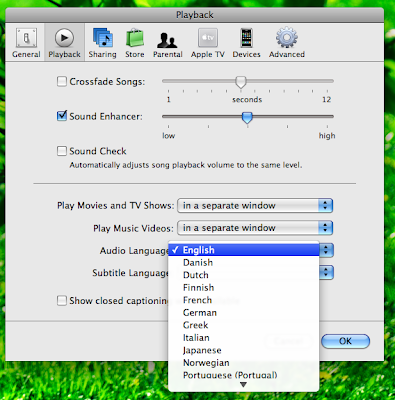 iTunes has an audio language default setting and it is great for videos that contain multiple audio tracks. An application that can create these QuickTime videos is Handbrake. It lets you select up to two audio tracks. The new grid view in iTunes 8 is great for podcasts because of the option called "New". What it does is it only displays podcasts that have unwatched episodes. It is the "New" tab in the top bar. MacUpdate has extended the bundle for an additional 48 hours and added the application Kameleon. 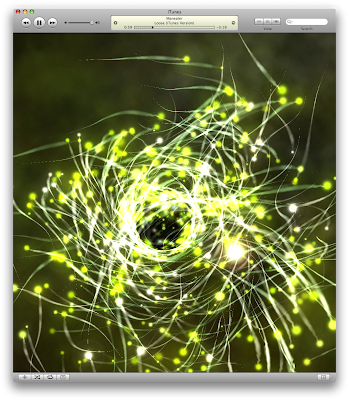 Kameleon lets you customize the look of OS X Leopard. The default look is automatically backed up if you want to go back to the standard look. More info here on MacUpdate. 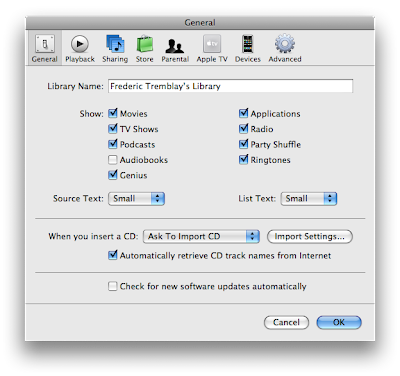 The settings in iTunes 8 no longer include a Podcasts tab. To change the Podcasts settings, you have to click on "Settings..." in the lower left corner of the Podcasts window. This "Settings..." buttons was always there, but in iTunes 8, it is the only way to access the Podcasts settings. 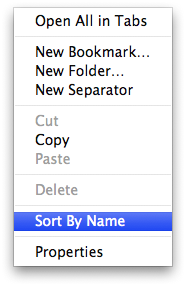 There is an easy way of sorting all bookmarks in the Firefox bookmark bar by name. The feature is right there when you right-click on the bookmark bar: "Sort by Name". If you are interested in the MacUpdate bundle, there are two days left. All the apps are now unlocked. 1. Go to Network, System Preferences. 2. Choose "Airport" (or Ethernet). 3. Click on "Advanced" and go to the DNS tab. 4. Add the DNS addresses in the left text box "DNS Servers". An advantage of adding it to the Airport settings of a specific Mac is that you'll still be using the Open DNS addresses when you are using any other wireless network. You can also create an account at OpenDNS.com and it will let you filter out some websites. You can also whitelist some websites to make sure they are not blocked by their filtering. No filtering will happen if you don't sign up for it on their website though! One thing that is useful, but sometimes annoying, in Apple Pages is when moving tab stops in the top bar. What happens is that the tab stops move in steps, going from 0.5" to 0.625" to 0.75". It is a lot more precise, but what if you want something in between. You can get smooth scrolling of the tab stops by holding down "Command". Mellel is part of the MacUpdate bundle. Mellel is being touted as the leading word processor on OS X, so I really wanted to give it a try and see for myself how good it is. At first glance, it does look pretty great. I really have to work on a project in Mellel to know if I'll use it on a daily basis, but it looks feature complete. It integrates with the bibliography application Bookends, another app included in the bundle. 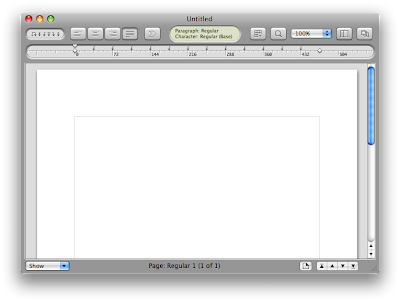 It also includes export to the Microsoft Word format, but not to Apple Pages. More info here on MacUpdate. Converting RAW files to DNG! RAW files are not open and are exclusive to each camera manufacturer. Adobe released an open RAW format called DNG. 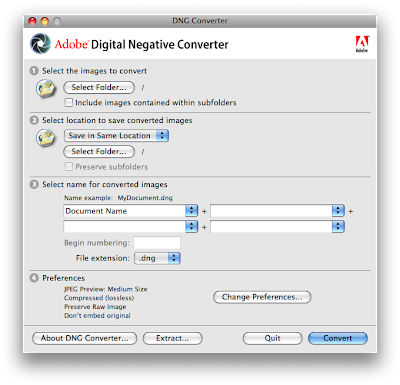 You can easily convert your photos to DNG using the "Adobe DNG Converter". The conversion is completely lossless and you actually save hard drive space. The advantage is that there are a lot more chances that DNG will still be readable in years than a closed format. You can get the Adobe DNG Converter here from MacUpdate. The Inspector in QuickTime Player! I don't think I have ever talked about the Inspector in QuickTime Player, but I use it all the time. I do a lot of video and the Inspector in QuickTime really gives you all the info about what the file really is. You can also figure out if a file is playable on an iPod/iPhone by seeing the size and the data rate. It also displays info about frames per second and codec. The feature that I like the most in that Inspector is Current Size. I didn't really understand the point of the Current Size at first, but I now use it a lot. The way I use it is that I often work with HD files that I know will end up being further compressed and resized to a smaller size. I want to get a preview of what the file with look like. I really just have to resize the open QuickTime window and the current size will update with the info about the size at which it is displayed on screen. You can access the Inspector through the keyboard shortcut Command - I.
Contactizer was just unlocked and is now part of the MacUpdate 10 applications bundle. I didn't know Contactizer before I heard of this bundle, but I was surprised. It is the application we have always wanted from Apple, and even more advanced. It lets you manage emails, contacts, calendars and more, all in one complete application. You can quickly retrieve emails from specific contacts. It even lets you place Skype calls directly from the application. Not everyone needs that much power in this kind of application, so I really recommend you check out the trial. Overall, if you are looking for this kind of app, it is a 5/5. More info about the bundle here. 2. Change "Privacy level" to "Allow only contacts on my contact list". Checking for purchases in iTunes! If you purchase videos or files on iTunes that are large to download, you might not always have time to download the whole file. 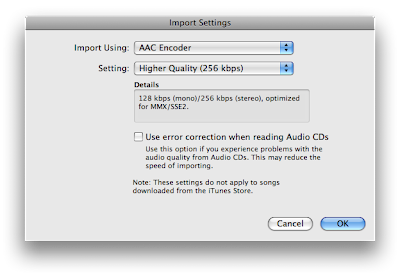 You can resume downloads with iTunes purchases though. If the download is not done, you can even restart the whole download. 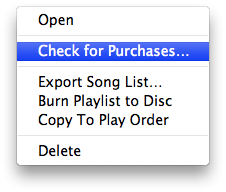 To do so, you just have to right click on the "Purchased" list in iTunes and choose "Check for purchases...". It will connect to iTunes, ask you to log in if you are not logged in and check if you have any purchases that weren't downloaded. Backing up is a must once files are downloaded though, because you won't be able to redownload once the download is completed. Scroll wheel and tab bar in Firefox! I know it is the second day in a row that I post a tip about Firefox, but I just discovered it and I think it is really awesome compared to how Safari handles tabs. In Safari, if you have more tabs open than how wide your Safari window is, an arrow with a dropdown menu will appear. In Firefox 3, an arrow also appears and it lets you move left to right in the tab bar, but there is a quicker way. If you have a mighty mouse, a recent trackpad on a laptop or any mouse that lets you scroll horizontally, you can move through the tab bar when it has too many tabs open just by scrolling. Your mouse simply has to be on top of the tab bar. DEVONAgent is part of the MacUpdate 10 applications bundle. DEVONAgent is really a weird application when you are not used to this kind of app. The application is very advanced however. I am slowly getting used to it. I don't think the application is for everyone, but it does find very relevant search results. If you do a lot of searches that don't come up with a lot of results and many results have dead links, it is definitely a great improvement. It takes more time than Google because it doesn't just look in a database, it actually reads every search results, making sure the link is still alive and enhancing even further relevance. Overall, I would say it is 4/5. Link here. If you have the status bar enabled in Firefox 3 (View menu and "Status Bar"), you'll get a quick preview of the status of downloads in the status bar. What is displayed is the number of active downloads and the time remaining. Clicking on the info will open the Downloads window.